The Iskar municipality is a bustling urban zone with a population of over 70,000. Within it are the four neighborhoods of Druzhba 1 and 2, Dimitar Milenkov, Abdovitsa, and the village of Busmantsi. 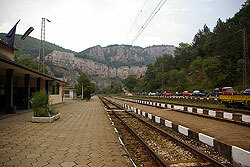 The Gara Iskar railway station is surrounded by the industrial area of the same name. Iskar also has some areas for recreational diversions including a park with rare tree species and a lake. The Iskar River bisects the municipality. Busmantsi is a small village just east of the city centre and surrounded by fields and an industrial area with several factories. Busmantsi is on the other side of the River Iskar from Sofia Airport and the industrial area called Gara Iskar. An old Roman road, the Troyanov Path, is in Busmantsi, as are several ancient mounds. 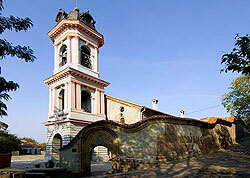 The Church of the Holy Virgin (Sveta Bogoroditsa) is here as well.